§ Mix cooked sausage and cream cheese together. § Cut Jalapeños in half and remove seeds. § Boil water and add Jalapeños for 3 minutes. § Drain and let cool. 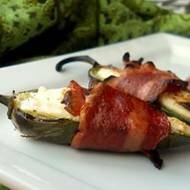 § Fill Jalapeños with cream cheese mixture. § Chill in fridge for 1 hour. § Wrap Jalapenos in Bacon and secure with Toothpick. § Refrigerate for 1 hour. § Grill mark and finish in 450 Degree oven until Bacon is crispy. § Place on platter, remove toothpicks and serve.